Ms. Cruiser made a dinner reservation at The Bristol before we headed to The Second City for late-night laughs. I was thrilled. 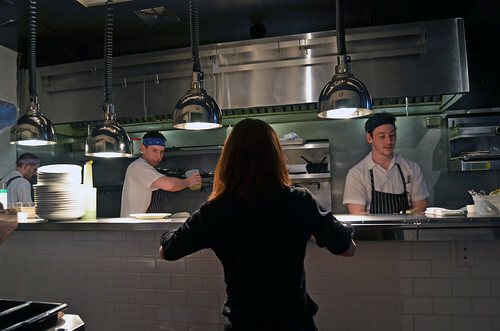 GQ named The Bristol one of the 10 best new restaurants in the United States in 2010, and the restaurant garnered a Bib Gourmand acknowledgment by Michelin this year. All cocktails are $11 each. 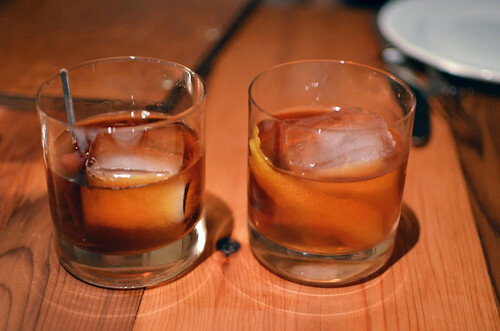 One of these was a Vieux Carre (Templeton rye, Courvoisier VS, Carpano Antica, Benedictine, bitters). 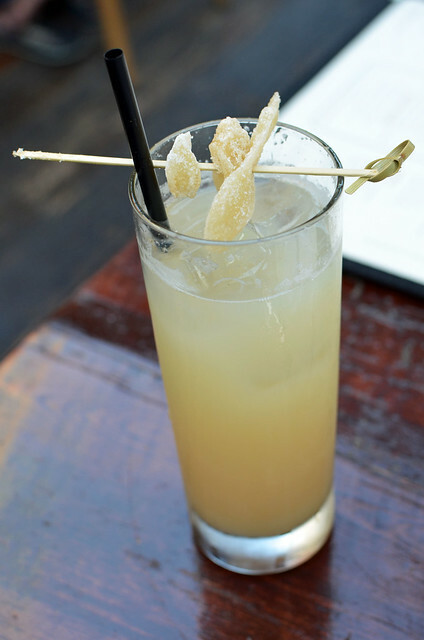 I don't remember what the other was, but I did have a marvelous Moscow Mule (Prairie vodka, fresh lime juice, Barritt’s ginger beer) later in the night. 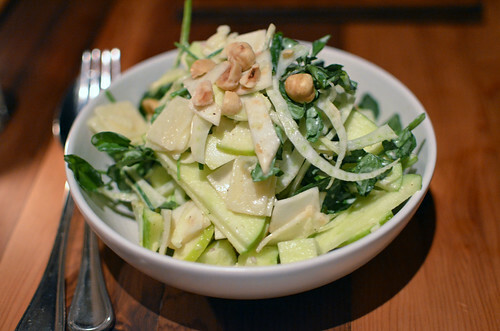 Apple salad, marinated Manchego, hazelnuts ($12). Refreshing and made us feel good about ourselves. Scotch olives, pork sausage, lemon crème fraîche ($7). I don't even like olives, and I loved these. Very special. Must get. 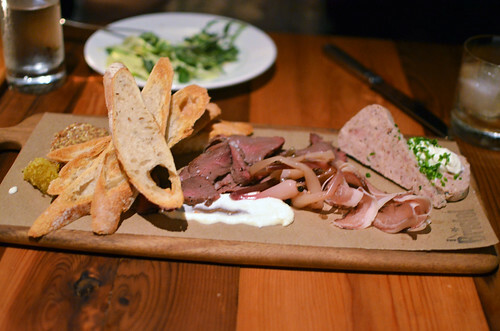 Charcuterie board -- beef heart pastrami, ham hock rillettes, lonza, assorted accompaniments ($19). Varied and abundant. If you like charcuterie, you won't be disappointed. 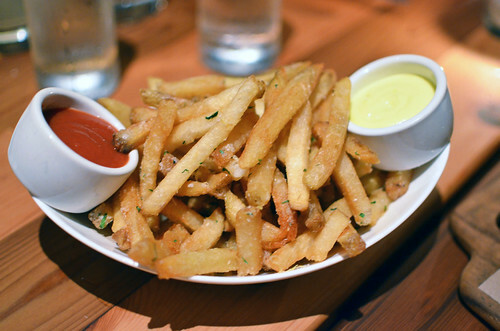 Duck fat fries, house ketchup, garlic aioli ($7). Is there any question that we enjoyed these? 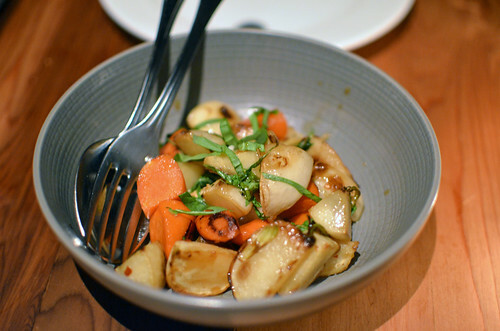 Roasted carrots and turnips, honey, basil, chile ($8). 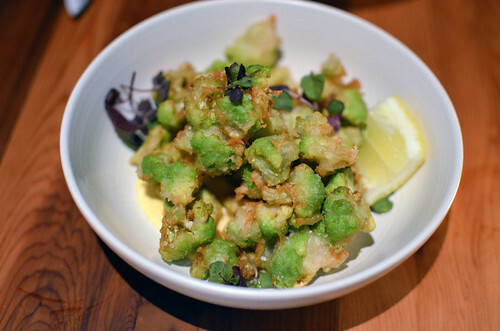 Witbier Romanesco tempura, anchovy aioli ($8). I had to ask the server what Romanesco was. It's like a cross between broccoli and cauliflower. I guess "Romanesco" sounds fancier than "broccoflower." 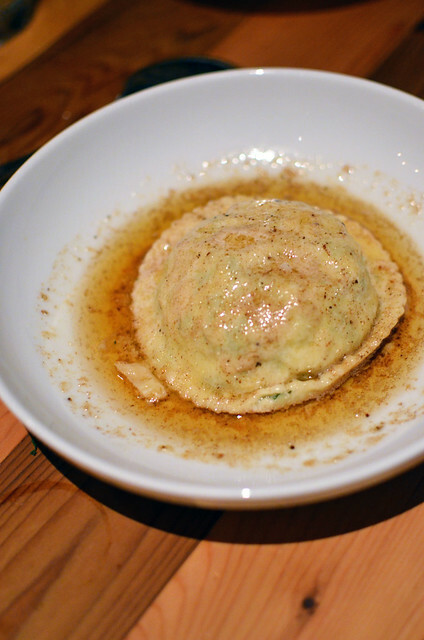 Raviolo -- ricotta, egg yolk, brown butter ($14). Super decadent and fabulous. I mean, just look at it. Favorite. 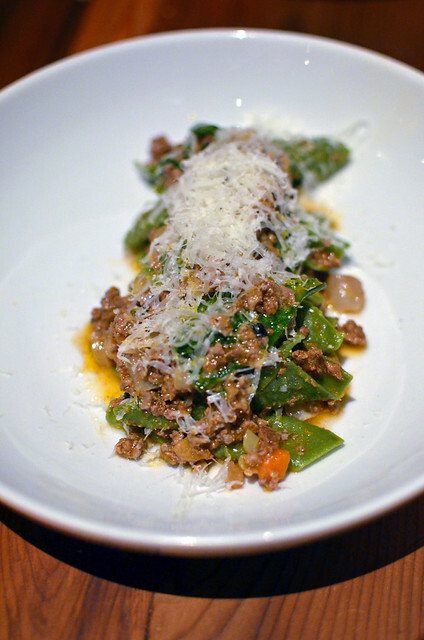 Nettle garganelli, lamb ragu, ramps, pecorino ($17). Nicely spiced, hearty and meaty, and the pasta was perfectly al dente. 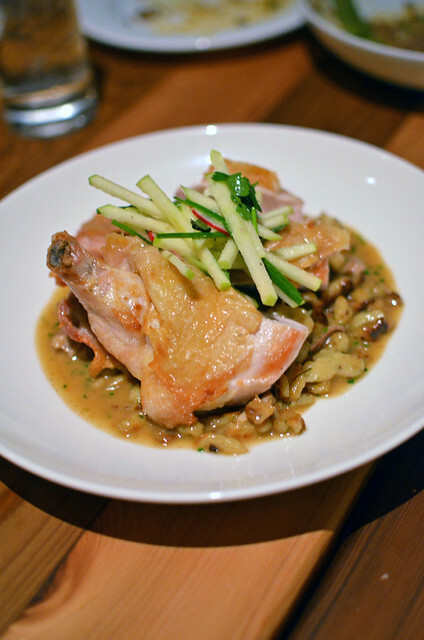 Roasted half chicken, dill spaetzle, crunchy salad ($20). Some mighty fine comfort food. 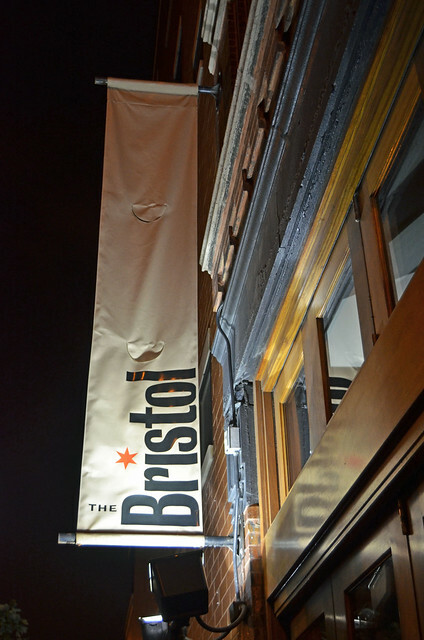 Our dinner at The Bristol was solid but not extraordinary. We weren't raving about the meal later, but everything was rather appetizing; there were a few standout dishes and no misses. Definitely thumbs up for The Bristol but not way up and jumping for joy. My buddy ProfSwank is going to Chicago soon, so I'm going to do a few posts on our weekend May trip with the Cruisers. 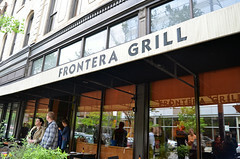 We got to Frontera Grill about five minutes before it opened, and there was a long line to get in already, even in the rain. There are no reservations here. Just get there and cross your fingers. 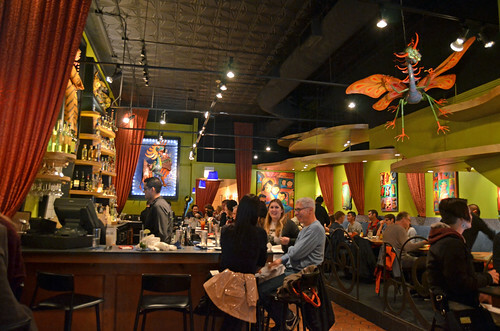 Chicagoans love multiple James-Beard-award-winning and Top Chef Masters champion Rick Bayless. 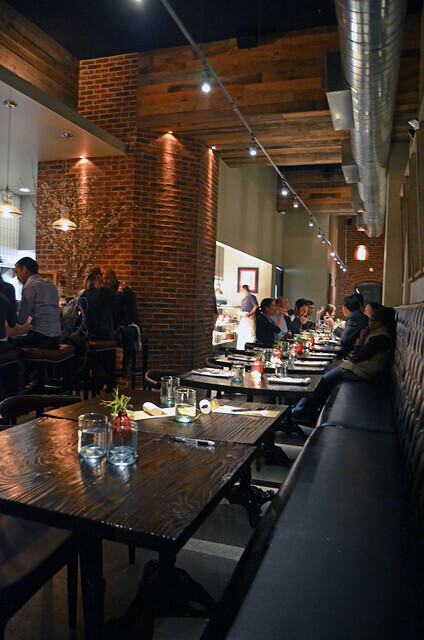 Disappointed by the douchebaggery at Bayless' Red O in Los Angeles, I was wary. Why was I waiting in the rain for this? 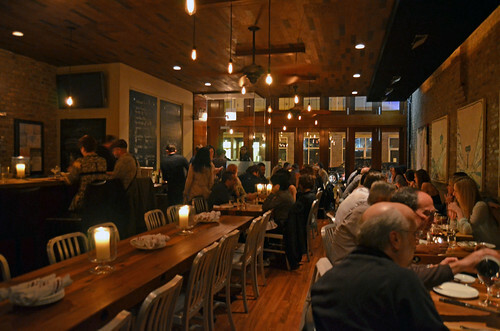 Luckily, Bayless' flagship restaurant redeemed him. Our brunch was a hit, and the four of us had a lovely time. 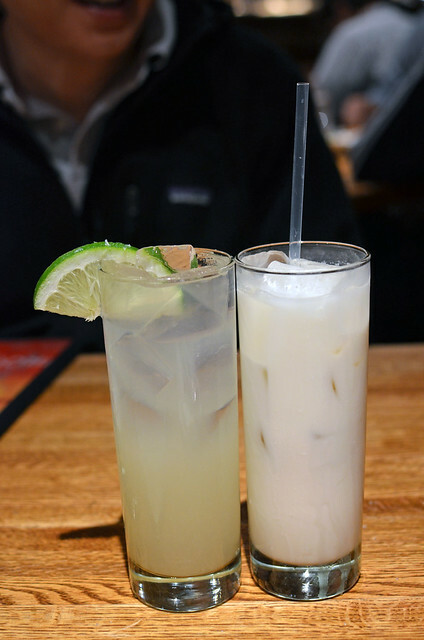 Fresh-squeezed limeade with sparkling water and coconut horchata ($3.50 each). 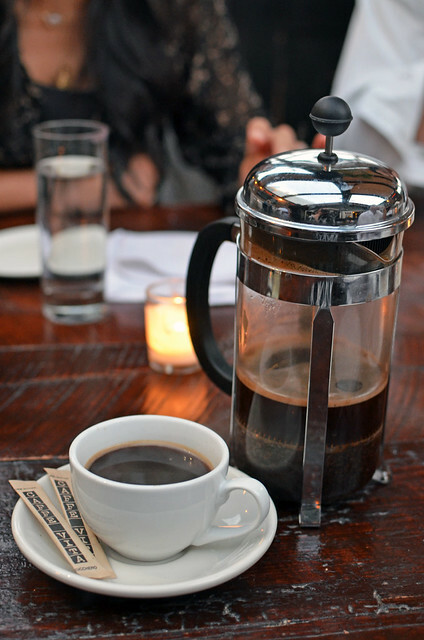 Press pot "coffee with a cause" -- 100% organic beans from La Perla de Oaxaca ($4.75). 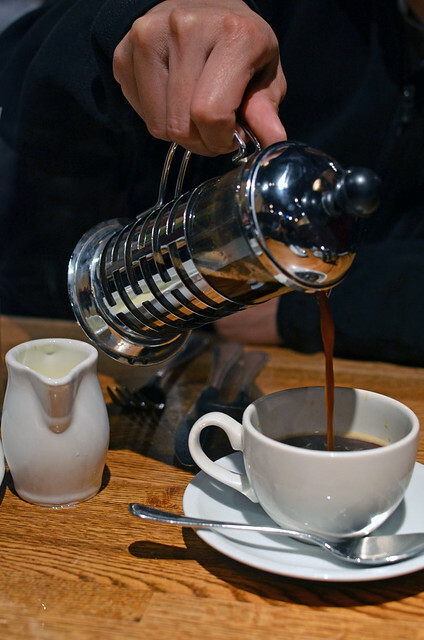 The beverages at Frontera Grill are excellent, be they fresh and tart, sweet and creamy, or hot and caffeinated. 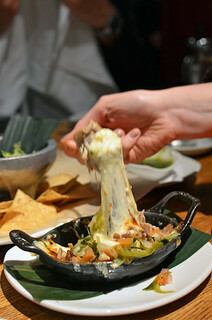 Guacamole de tocino -- Gunthorp bacon, wood-grilled Bayless Garden garlic chives, Serrano chile, tortilla chips ($9.50). Meaty and smoky! 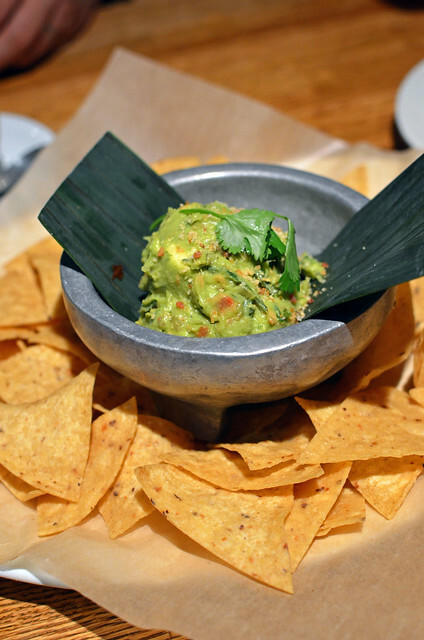 Definitely not your ordinary guac! 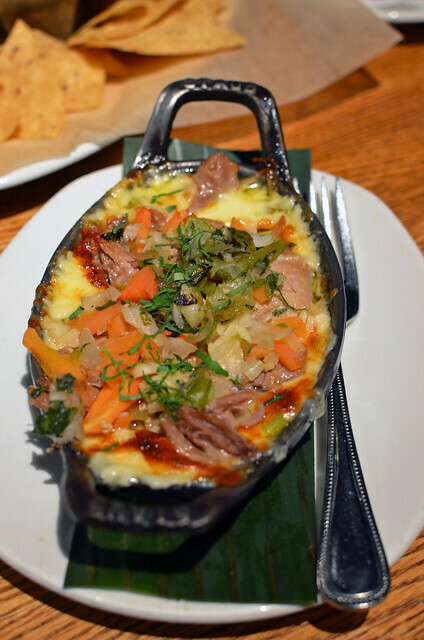 Queso fundido de carnitas de pato -- Otter Creek organic cheddar, duck leg carnitas, grilled knob onions, pickled jalapeños and vegetables ($9.50). This appetizer was my favorite part of our meal. Cheese! Duck! Mr. Cruiser's surprise and wonder! Huevos fronterizos -- two eggs sunny-side-up in ajillo sauce (chipotle, roasted garlic) with homemade chorizo and homemade buttermilk biscuits, tangy baby greens ($13). Excellent selection by Mr. Cruiser. Lots of strong flavors that worked well together. 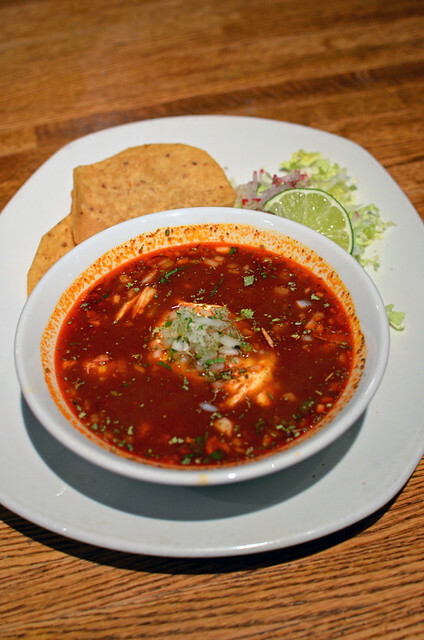 Pozole rojo -- pork and hominy soup infused with rich red chile with one poached egg ($12.50). Ms. Cruiser couldn't pass up this hot stew. Perfect for the rainy day. 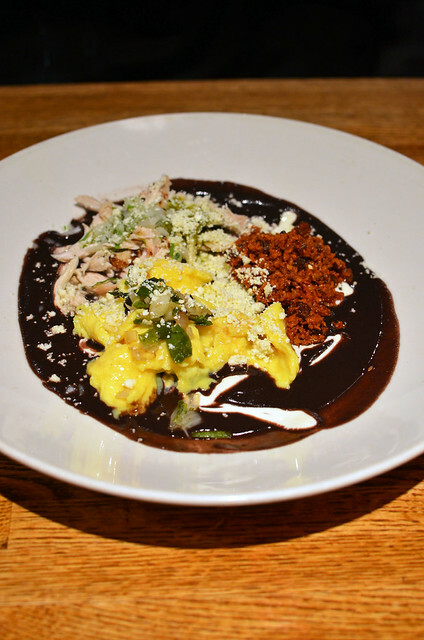 Sapitos -- a trio of Xalapa-style gorditas (corn masa cakes), each with its own toppings: (1) scrambled eggs, (2) grilled chicken, and (3) chorizo all in chipotle black bean sauce with homemade crema and queso fresco ($13). Mr. Monkey ordered what I thought was the best entree. It was like a buffet on a plate. 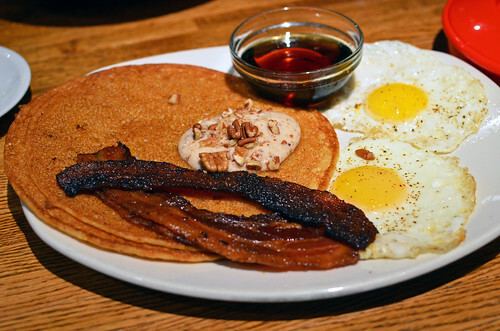 Hot cakes indigenas -- Three Sisters Garden Heirloom corn pancakes, whipped goat cheese, organic agave syrup, red chile-glazed Gunthorp hickory-smoked bacon, two eggs sunny-side-up ($13). I got the loser of the day. It was tasty but not nearly as interesting as the description made it seem. This platter is ideal for your friends who are boring eaters. 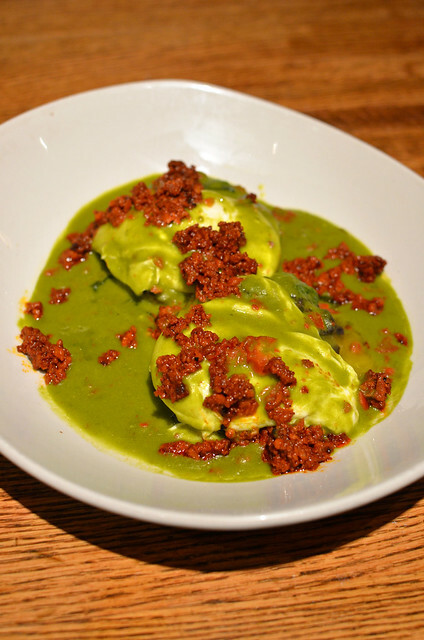 Is Frontera Grill worth a tourist visit? I'd say yes, especially if you are from a locale without good Mexican food. 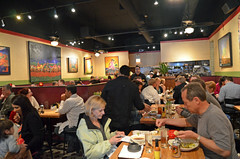 However, if you are from California, Texas, or some other place with great Mexican eats, you may not be as easily won over. We celebrated Ms. Cruiser's birthday this year at Tar & Roses. It was worth the trek to Santa Monica. Yeah, I said trek. It's a trek now for me. Sigh. 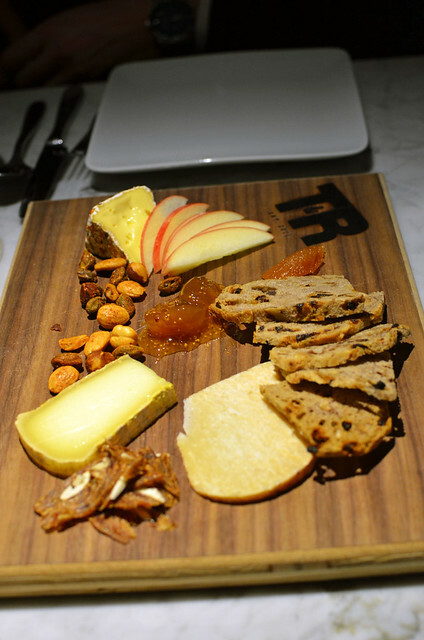 Complimentary cheese, fruit, nuts, bread. Why complimentary? Because we waited 15 minutes for a table even though we had a reservation. The host, server, and manager were all very apologetic and also gave us free beverages. The Cruisers opted for some wine, while we downed two Fever Tree ginger ales. It was a good start. I like when people in the hospitality industry care about your happiness, make an effort, and say sorry when it's warranted. 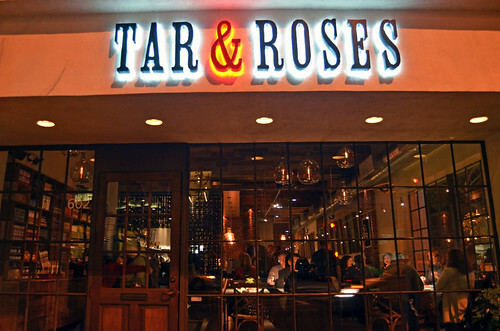 Kudos to the Tar & Roses staff for this. And the night only got better. Chicken oysters on a stick, tamarind ($7). How can something so simple be so good? 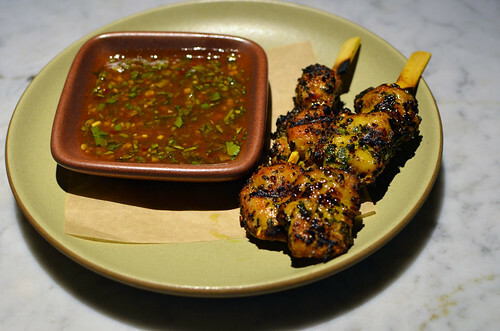 These were just grilled chicken spheres on sticks, and they were super. 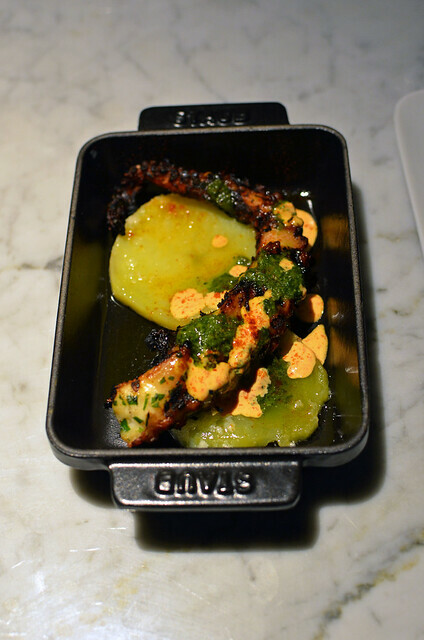 Charred octopus, Yukon potato, salsa verde, piquillo pepper aioli ($9). I loved every blackened bite. 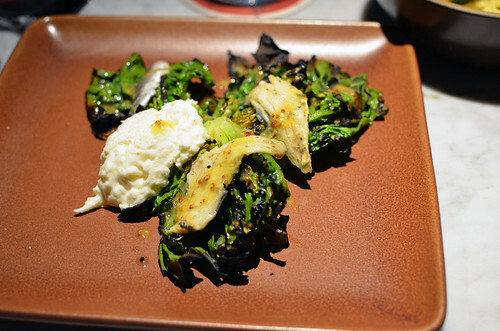 Charred little gem lettuce, pickled sardine, burrata, dijon ($10). Oh, the char! They do the char so well! Even on lettuce! Paired with burrata? Fab! 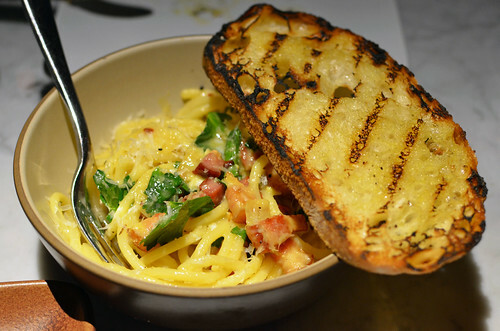 Bucatini carbonara, duck egg, pancetta, Parmesan ($12). Enjoyable but no wow factor. 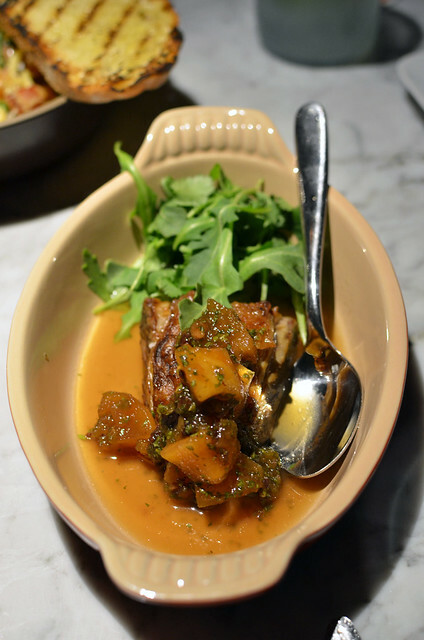 Braised lamb belly, apple chutney ($11). If there's lamb on the menu, Mr. Cruiser will get it! 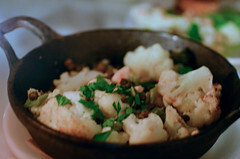 This night was no exception, and this was a lovely home-y dish. Very comforting. 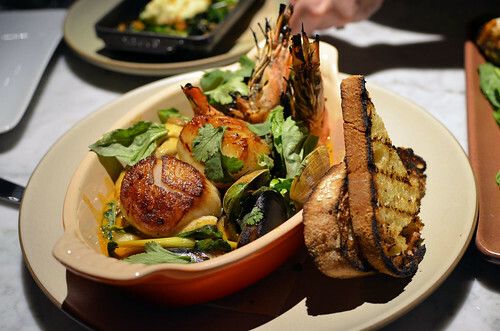 Shellfish pot -- scallops, clams, mussels, shrimp, maitake, curry ($23). Ms. Cruiser picked this one, and we were all very happy she did. It was a brothy seafood bonanza! 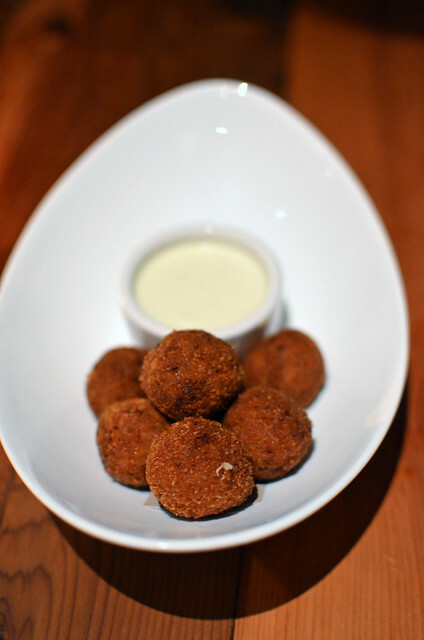 Baby broccoli, Parmesan pudding, olive oil croutons ($8). Tar & Roses has a fairly ample vegetable section. 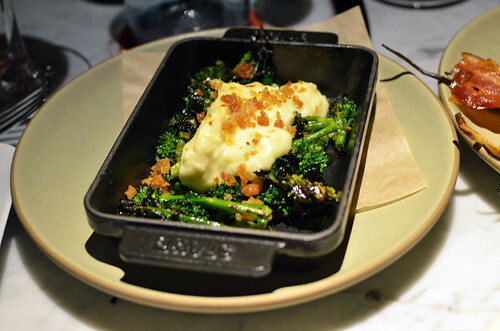 The Parmesan pudding and olive oil croutons really made this broccoli a treat to eat. 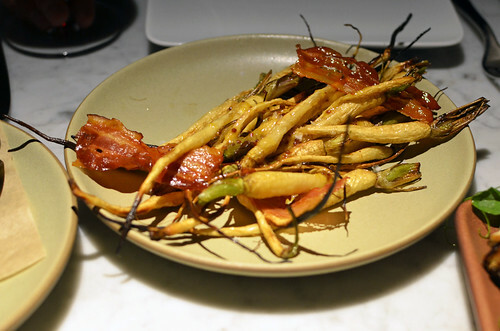 Wood-roasted parsnips, honey, mustard, crisp pancetta ($8). I'm not sure if I'd ever had parsnips in their original form before this night. They looked sort of alien and creepy, but the pancetta accompanying them helped me get over their weird appearance. 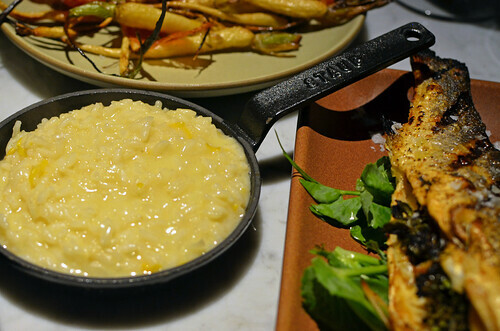 Wood-roasted whole branzino, Meyer lemon risotto ($24). Impressive. It's not often you get a whole fish with the head when you're at a non-Asian restaurant. 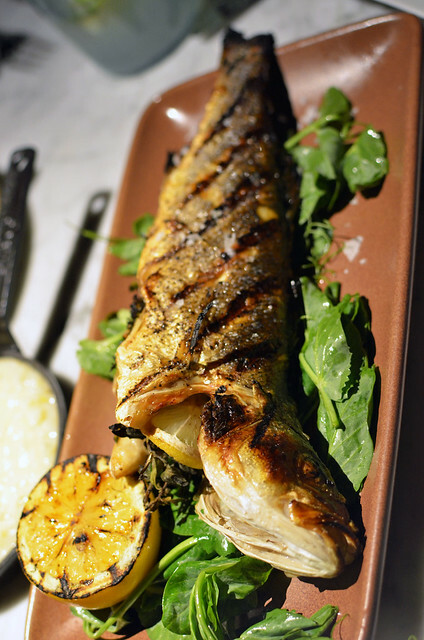 The Meyer lemon risotto was the perfect tart partner for this branzino. 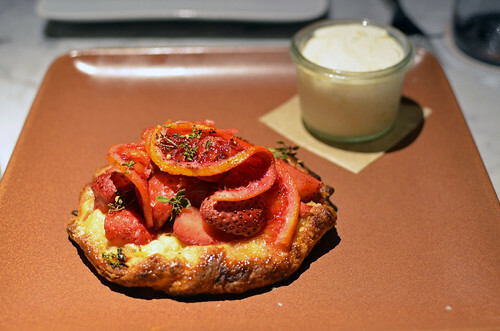 Strawberry ricotta crostata, honeycomb ice cream ($9). Extraordinary. I'm not a big dessert person, but I can honestly say that this was my favorite dish of the night. You should go to Tar & Roses just for this. 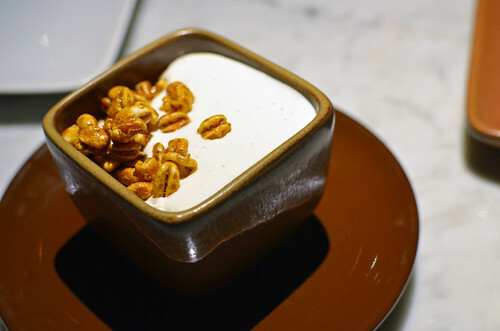 Chocolate hazelnut budino, whipped yogurt, candied wheatberry ($8). 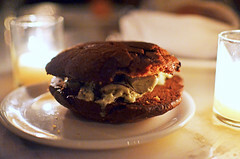 I only had a bite of this because it's chocolate, but my taste was rich, creamy, and dreamy. 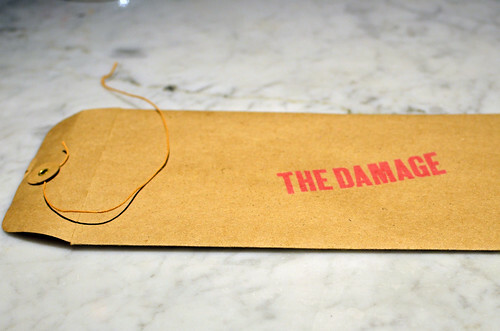 Your bill will come in this clearly labeled envelope. And the damage won't be too terrible. Very good meal for a decent price. I'd return. 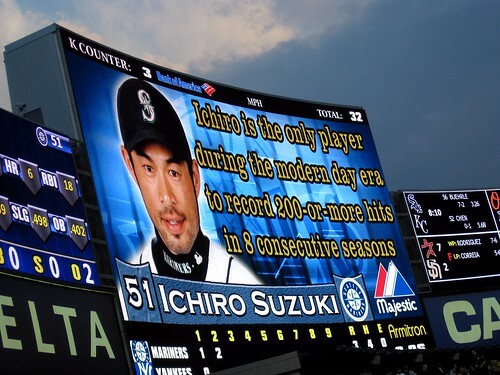 Go, Go, Go, Go, Ichiro! 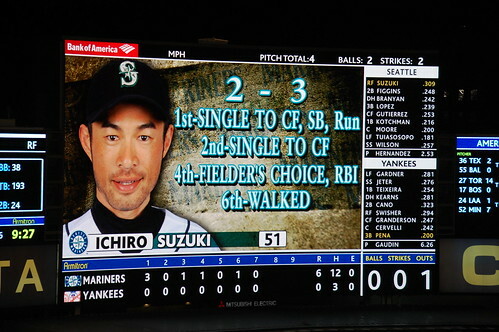 If you're a longtime reader, you already know about my baseball boyfriend, Ichiro Suzuki. 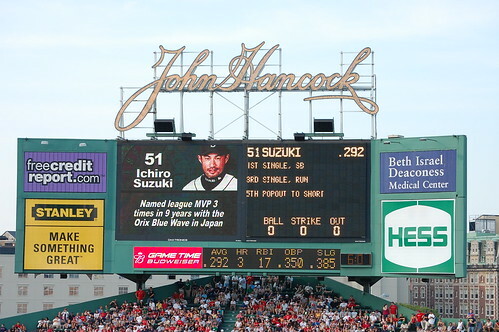 I watched him play the Red Sox at Fenway. 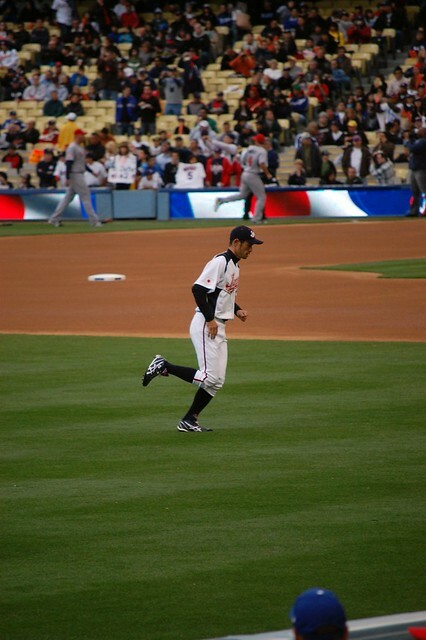 I watched him win the World Baseball Classic with Team Japan. I watched him beat the Yankees. I even have his all-star t-shirt and wore it in a sea of Yankee fans. And now he's going to be a Yankee, and I'm going to see him again when we go to New York City in September! My brother sent me the best link tonight. The e-mail just said, "Two things you like." Behold my new favorite song! "Ichiro's Theme" by Ben Gibbard! Yes, Ben! Death Cab for Cutie! The Postal Service! I'm obsessed with Ben, too! 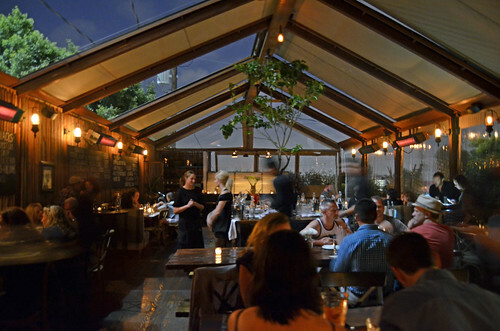 Did you know that you can have a wonderful meal on Sunset Boulevard and feel like you're dining in a secluded hillside cabin? I didn't until we visited Eveleigh. It was love at first sight and bite. We came here twice last month, once with the Oros and another time with the Cruisers. Both meals were excellent. Pictured above are the grilled Monterey squid ($12), crushed peas and burrata ($12), roasted cauliflower ($12), and the chocolate chip cookie sandwich with mint chocolate chip ice cream ($8). Is your mouth watering yet? Even with those tragically dark photos? Believe it or not, the other pictures that night were worse. 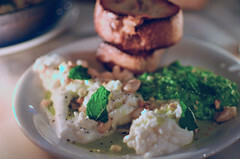 Be glad I spared you from more unjust representations of Eveleigh's fabulous food! Fear not, though! Here are the dishes from our earlier and better lit dinner. Incredible. Get this. The bite! It hits you back in your throat like WHAM! 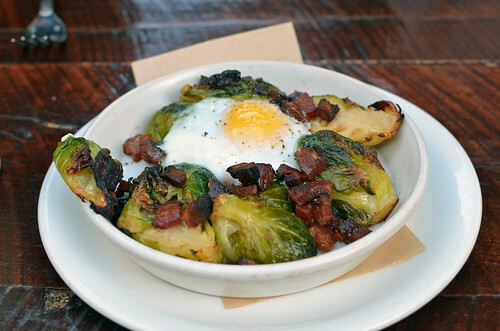 Baby Brussels sprouts, in-house bacon, soft hen egg ($12). Is that a thing of beauty or what? As delectable as it was pretty. 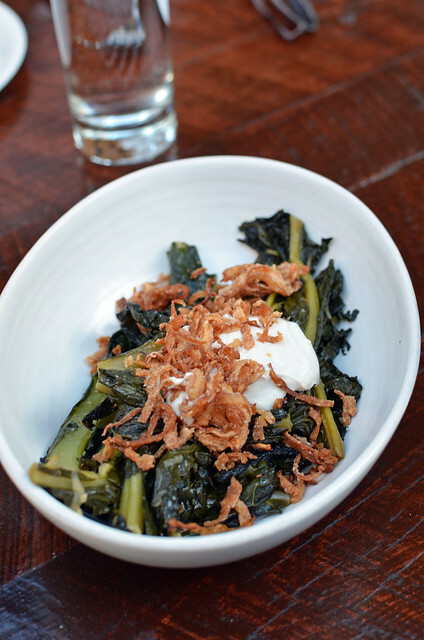 Black Tuscan kale, coriander, yogurt-tahini, fried onions ($12). 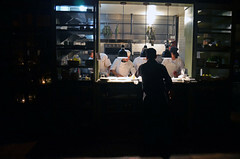 Eveleigh does its veggies right. This was no exception. 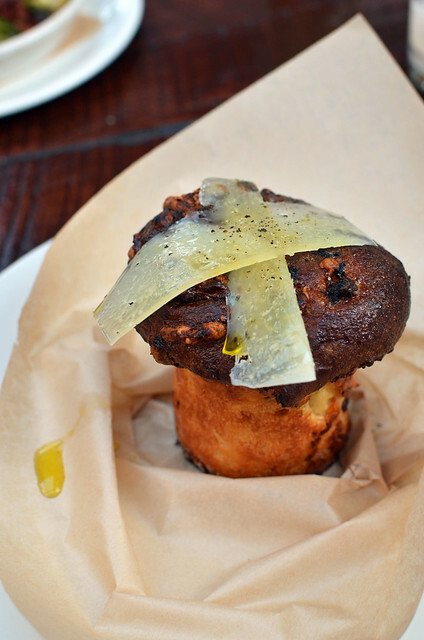 Barcelona bun -- brioche, chorizo, Manchego ($6). A nice little snack. Maybe ideal to give to a kid. 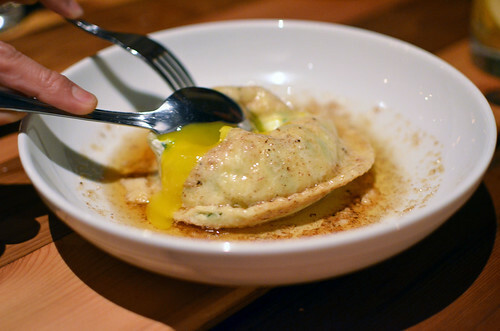 The real small plates are worthier of your stomach space, though. 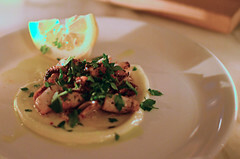 Grilled octopus, crushed fingerlings, arugula, harissa crème fraîche ($14). Yummeh! 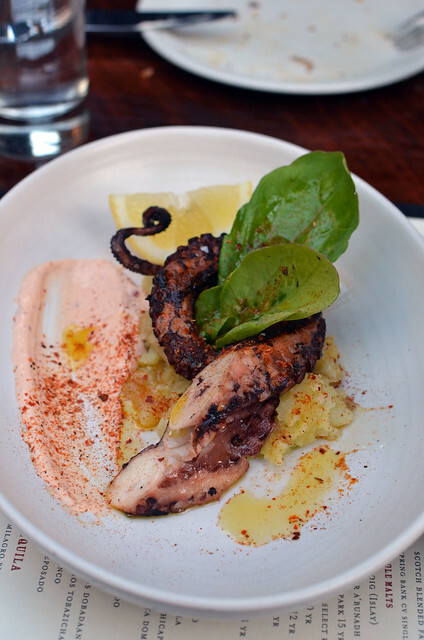 Nothing's better than smoky charred tentacles with spicy, creamy sauce! 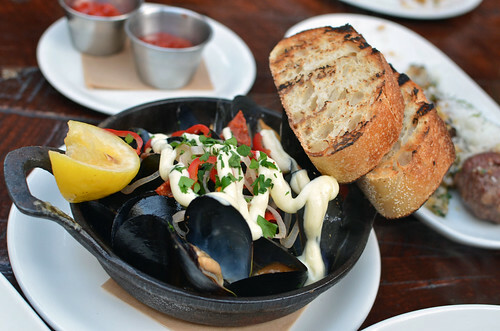 Pot-roasted mussels, chorizo, lemon, chili, parsley, aioli ($12). We made our own moules frites! See next photo! 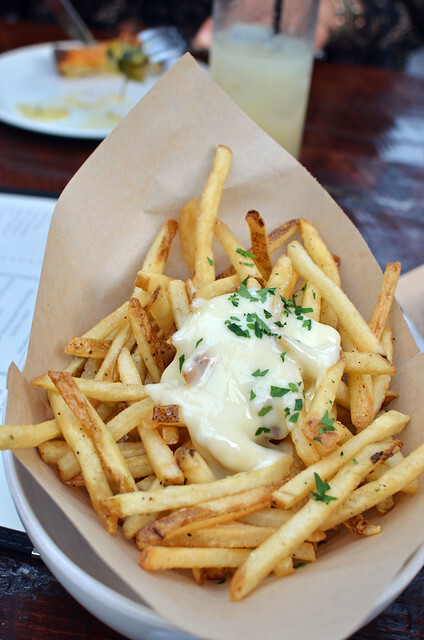 French fries, truffled aioli ($8). That aioli was some serious business. Very very garlicky! Yeah! 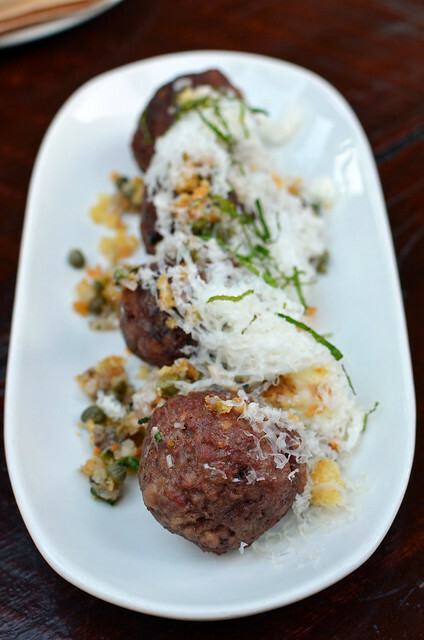 Sonoma lamb meatballs, crunchy breadcrumb salsa, lamb chopper gouda ($16). Who doesn't love meatballs? Tasty and not at all overly lamb-y. 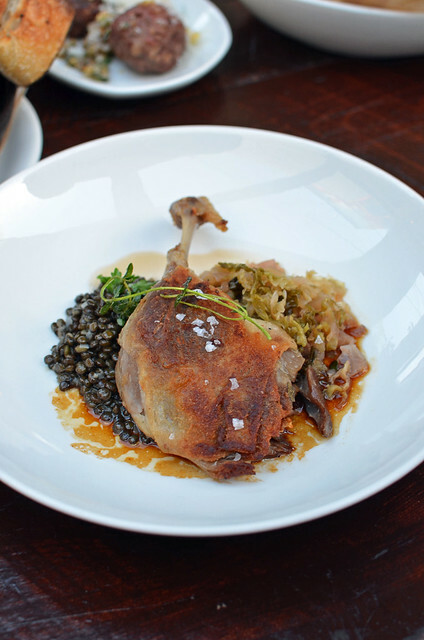 Confit duck leg, buttered beluga lentils, sour savoy cabbage ($18). My favorite dish during both of our visits. Crunchy, tender, salty, juicy. Love. Enough for a happy table of four! 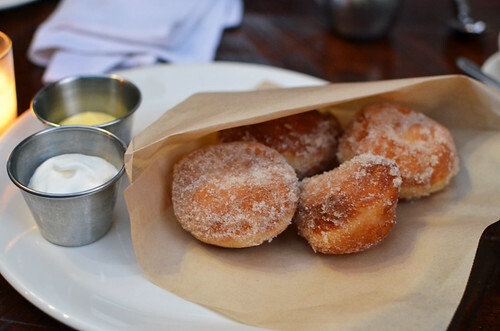 Warm doughnuts, spiced sugar, citrus curd, whipped cream ($10). Piping hot and fresh! And the citrus curd? Tart heaven! 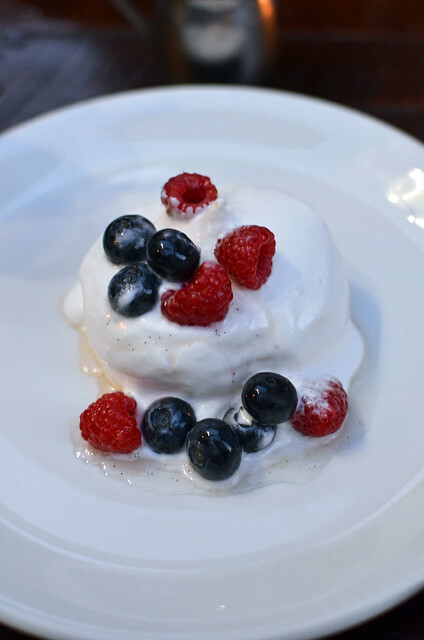 Pavlova, California berries, dried lime and rose syrup, cream ($9). A light airy cloud of lip-smacking loveliness. 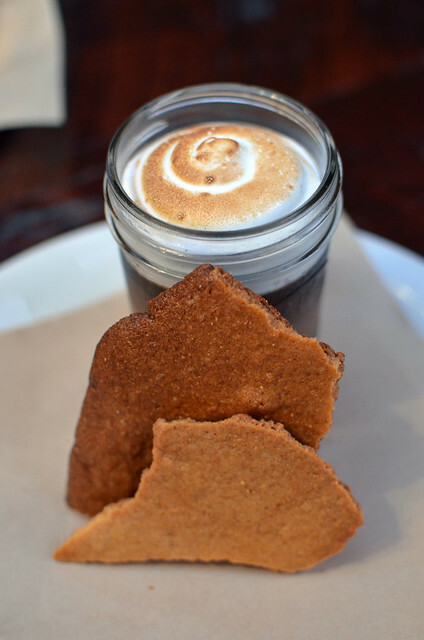 Dessert of the day -- S'mores pot de crème. Simultaneously avant-garde and familiar. Neat twist on an old favorite. 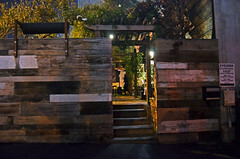 Eveleigh is a delight. 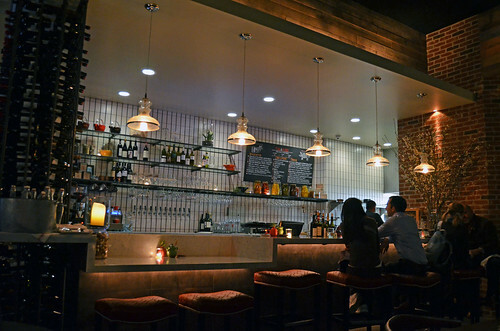 It's a great place for groups to eat, drink, and eat some more. Who Goes to Vegas in the Middle of the Week?